Audio Damage releases Mangleverb: "Swiss Army Knife for wild sonic destruction"
Audio Damage's latest plugin experiment involved it combining a thick reverb, a filter, an envelope follower, an LFO and a VCA. 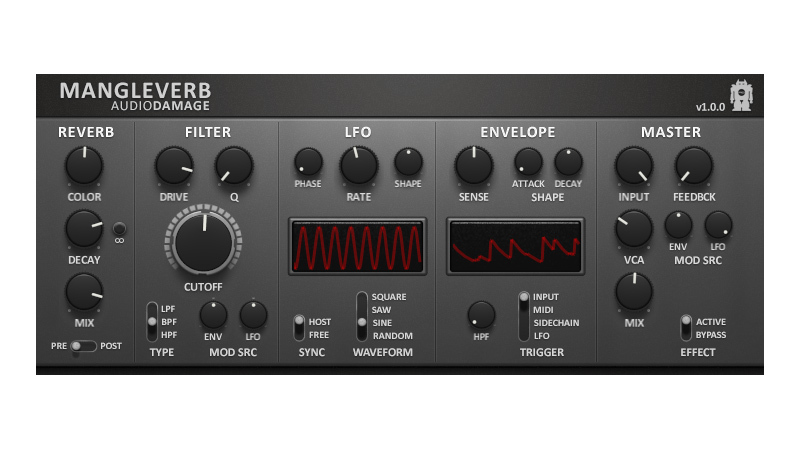 The result is Mangleverb, which "can be used as a filter, reverb, transient shaper, rhythmic gate, LPF gate, tempo-synced VCA, and any combination thereof"
Mangleverb, then, is full of possibilities - you just have to decide how you want to use it. It's available now from the Audio Damage website in AU/VST formats for PC and Mac. It costs $49. Simple-to-use algorithmic reverb that can be either pre- or post-filter/VCA. A monster resonant filter model with lowpass, bandpass, and highpass modes, and a drive circuit for gritty distortion. Sophisticated tempo-synced LFO with waveshaper to create all common (and some uncommon) modulation shapes. Envelope follower with internal, LFO, sidechain input, and MIDI trigger modes. Feedback path and modulated VCA for final signal taming.